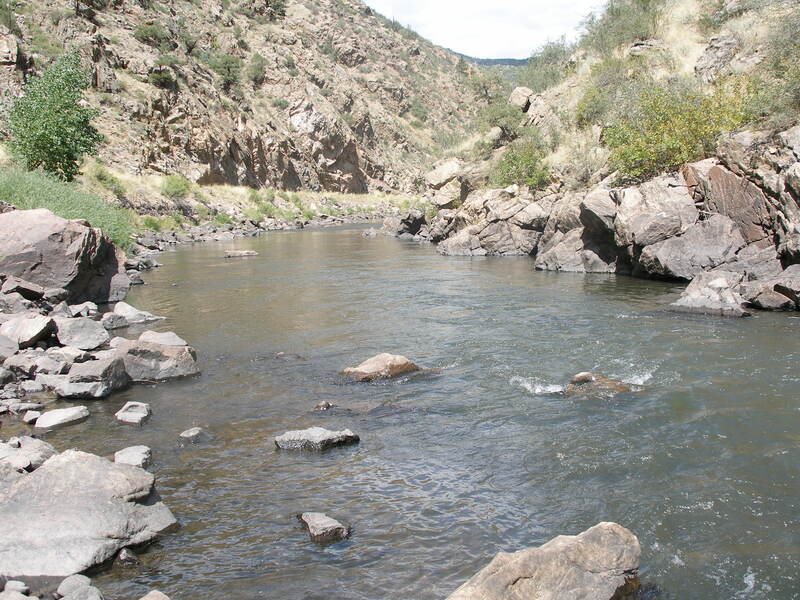 I checked the Royal Gorge Anglers web site, and the report looked promising. 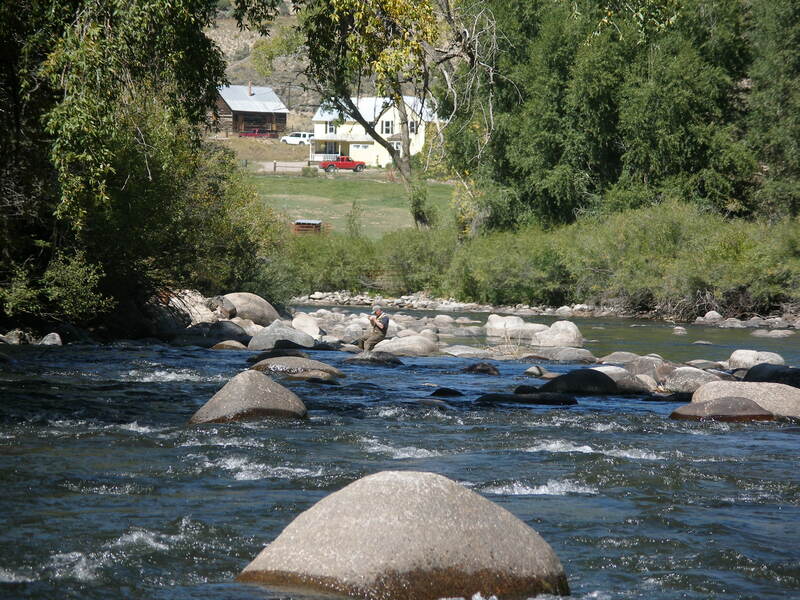 Flows were decent, and owner Bill said fishing was good in the morning and late afternoon. Fishing riffles deep with rubber leg stones was producing in the mid-day. Armed with this optimistic information I drove to the Arkansas River hoping to hit the elusive red quill hatch that I had not encountered in four or five years. I decided to drive to the special regulation water between Salida and Wellsville, because that is where I hit red quill hatches in the past. The location of our new house necessitated a three hour drive to that stretch of the Arkansas. I arrived at the destination area by 10AM, and I rigged up and hiked down route 50, and then I climbed down the bank and crossed half way to the top of the island. I walked down the south side of the island, and then I crossed to the north bank and went down below the island a bit where a nice long riffle and run exists. I tied on a size 12 gray parahopper and trailed a beadhead pheasant tail. I worked the entire run, but I had no action, so I began working up the smaller north channel, where I frequently experienced success in the past. In this stretch I had a refusal and nicked a brown. 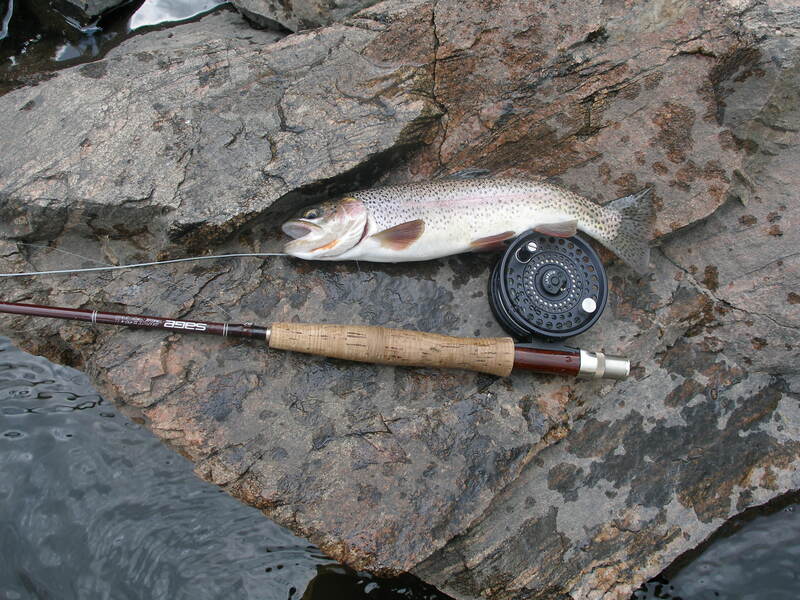 As I cast to the channel, I landed four trout, and some were quite nice. Most of the landed fish grabbed the trailing beadhead pheasant tail. When I got to the top of the channel, I covered the shallow tailout of the main river, where it spills into the smaller north braid. Here I landed another brown in some very thin water not more than two feet deep. I crossed back over and went back to the car and ate lunch. I took my lunch down to a rock ledge, and while eating I began to notice several fish rising in the wide smooth tail out of the pool in front of me. I went back to the car to return my lunch bag, and then I returned to the river and waded in. I noticed some small BWO’s emerging, so I tied on a CDC olive. I generated a look from the fish I observed during lunch, but I could not connect. I spotted three or four fish rising upstream and across from my position, so I targeted them. I hooked one, but when it ran across the current, I applied too much pressure and broke off the CDC olive. I tied on another and hooked and landed one of the fish, but the others were being very selective. I moved up along the shore to see if there were fish rising in the deeper run. 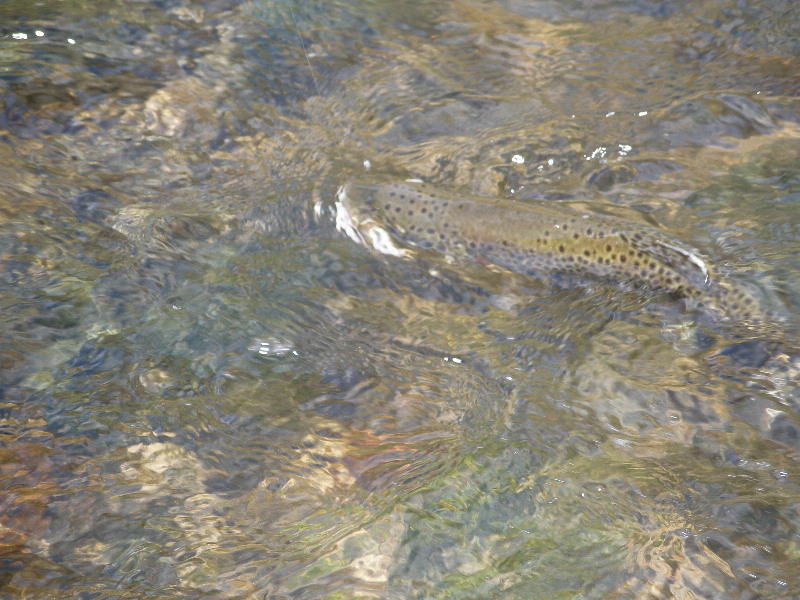 I spotted several rising in the riffles, and I cast and landed two trout in short order. Unfortunately the rises ended as suddenly as they began, so I reeled up and walked back down the highway to the island. I continued below the small island and started at the same point where I began in the morning. I decided to work deep with a beadhead prince and WD40 to imitate the BWO nymph. I drifted my flies through the beautiful run, but no action was forthcoming. Then I thought I would work up the north channel of the island again, but this time I would test the CDC BWO. Most of the fish I landed in the morning were in the top part of the channel. Sure enough, I landed two very nice browns on the CDC BWO and had a couple other momentary hook ups. Once I fished to the top, I followed the north shoreline up to the next section of pocket water. 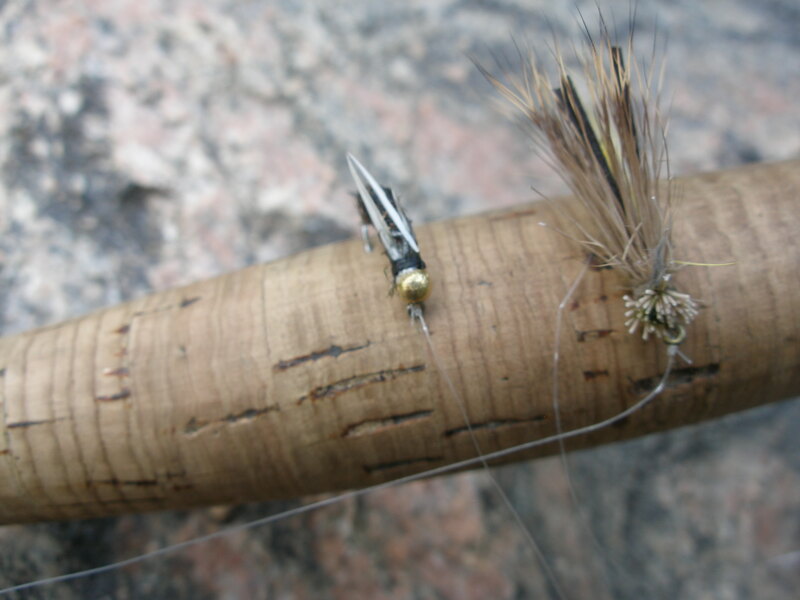 I did not see anymore BWO rises or mayflies, so I reverted to the gray parahopper and beadhead pheasant tail. I had the pheasant tail dangling only a foot or so below the hopper. 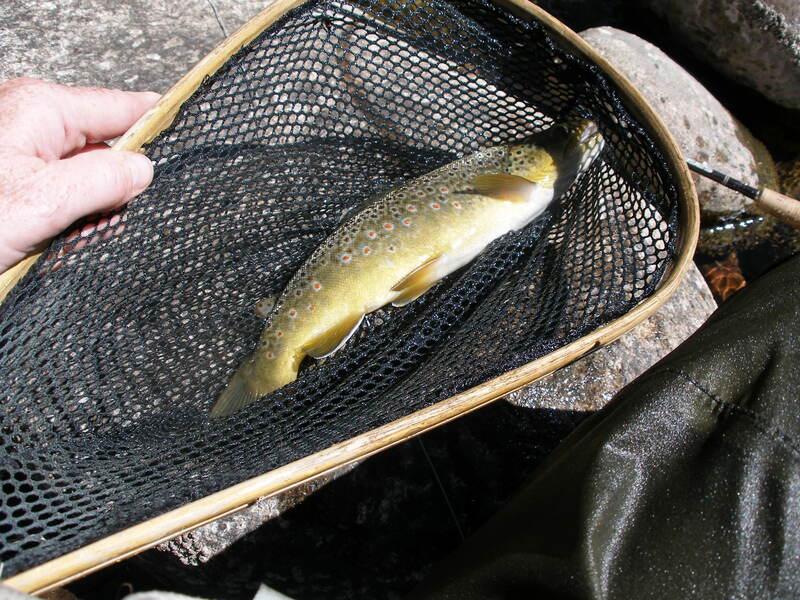 In the next section of pockets I landed two beautiful browns; one on the BHPT and one on the parahopper. 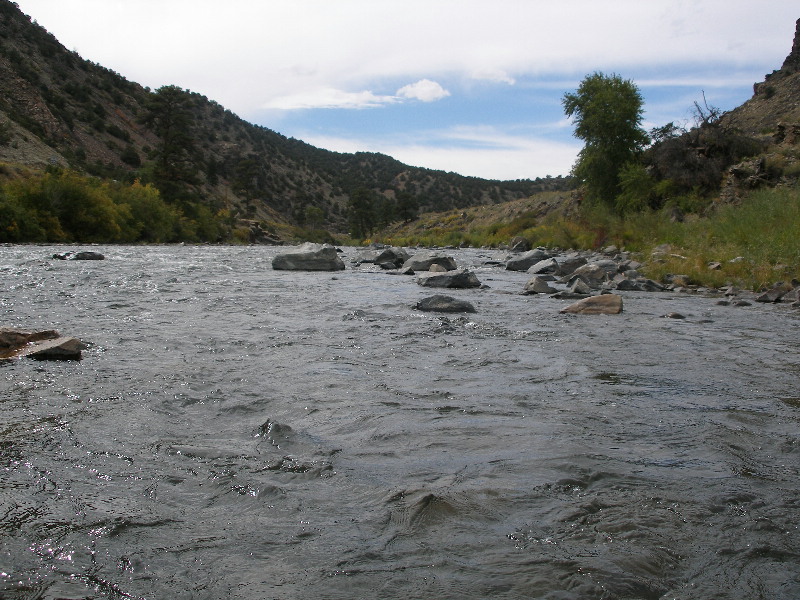 I continued progressing upstream, but the action slowed significantly, and in fact it disappeared. I went back to nymphing, and I tried a caddis pupa, and then switched back to attractor dries such as the lime green trude and some caddis dries. I had one trout rise and look at the green trude, but no more hook ups. At around 5PM, I realized I was not having any luck, and I called it a day. Jane works with a guy (Ben) who has a son and daughter, and the son wanted to fly fish, so I agreed to take them fly fishing on September 18. Consequently Jane and I drove Ben, Jessica and William to the Big Thompson River. 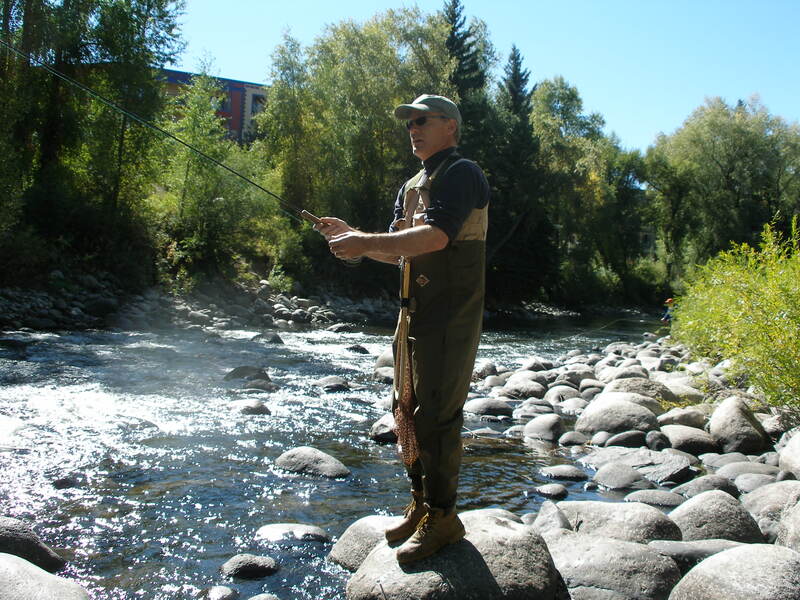 I packed my extra rods and waders, and when we arrived at the stream, I gave them casting lessons in the parking lot and showed them how to tie on a fly. Once this education was behind us, we approached the stream. I guided William in the morning, and he generated some rises, but they were either refusals or he did not react fast enough. At one point, I took the rod to demonstrate how to cast. I floated a caddis dry along the far bank, and a brown rose and slurped in the fly. I landed it and showed William how to catch and release. After lunch, I worked with Jessica. Her casting was not very good…too much wrist, and she did not pause enough before she executed her forward cast, so the casts were piling up at our feet, and the wind was adding additional difficulty. In an effort to counter these negatives I set her up with a double nymph rig and indicator and showed her how to sling it forehand and backhand. I put a prince nymph on the top and yellow beadhead caddis pupa on the bottom. The stream was relatively low and clear, and this added even more difficulty. We approached a fairly deep run below some white water, and she hooked up with a brown (I saw it flash sideways before it came off), and then added a momentary hookup with another fish. Finally she hooked a rainbow, and she played it to the pool below us before it came off. We worked upstream farther and finally in another deep pool, she hooked and landed a nice rainbow. While wading upstream she spotted a stonefly nymph case. I assumed it washed off a rock and was there for a while. I had her hold it while I took the photo with the super macro. I think I could have focused it slightly better. I set to manual focus and hit the up arrow until it looked focused on the viewing screen. After Jessica caught her fish, William wanted to fish again. 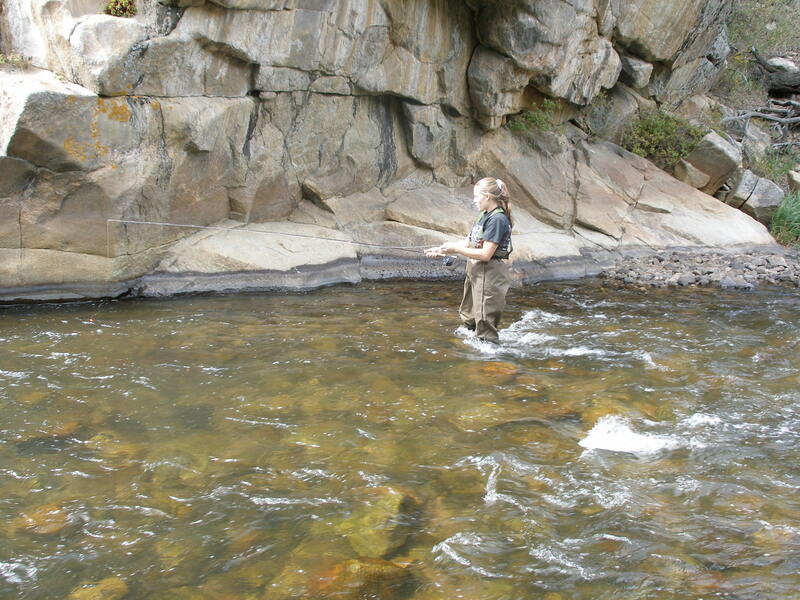 He didn’t put the waders back on, but eventually I got him to hook up in another deeper pool upstream. William’s fish was a rainbow, and he caught it on a prince nymph. When I work with rookies, it really makes me appreciate my accumulated knowledge of fly fishing. Being able to place a cast exactly where you want it is extremely key. Also, my flies are on the water in likely areas far more than novices. I think that may be the most important factor. And of course requiring multiple casts to the target area really reduces the chances of catching a fish. John Broadbent and I headed to the Eagle River. It was a beautiful day with temperatures in the high 70’s. We started fishing at the BLM recreation area west of Wolcott, and we hiked across the railroad bridge and fished along the north side of the river. John had a parahopper with gray body trailing a copper john. I started with a yellow Letort hopper trailing a beadhead pheasant tail, and then I switched to beadhead hares ear. We had no luck, so we quit around 11:30 and headed back to the car. In our pursuit of success we drove back east on I70 to the Edwards rest stop, where we ate our lunch. The river was exceptionally low with many boulders that were submerged earlier in the season, but they now extended halfway above the water. We went below the bridge to some pocket water and began working back up toward the bridge. John split off and went downstream. 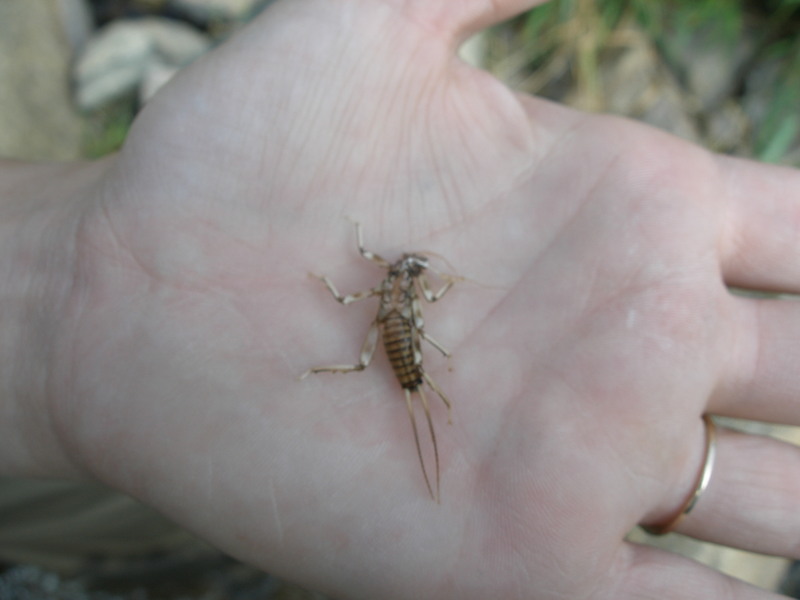 I worked back upstream and spotted some small BWO size mayflies emerging. I added a WD40 with glass bead to the end of the hares ear. 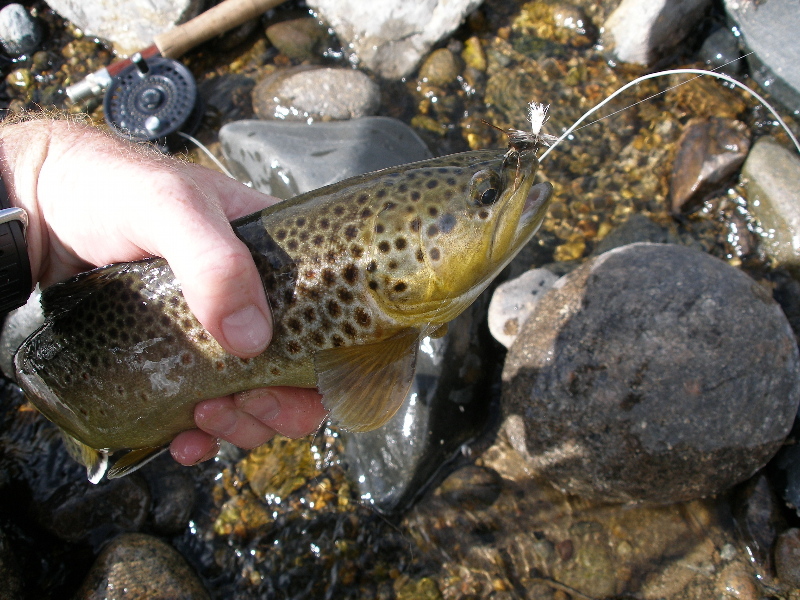 I finally hooked up with a decent brown in the frothy water at the head of a pocket, but the brown trout quickly freed itself. I continued working the hopper with two nymphs and hooked and landed two browns on the beadhead WD40. That was the extent of the success. John waded back upstream to where I was, and we walked under the bridge. John had a fish flash at the hopper on the east side of the bridge, but it never touched the hook. We worked our way up the left bank, and then eventually went on the path to the long deep run that is popular. Unfortunately several fishermen beat us to the sought-after spot, so I guided John on some pockets upstream, but we had no success and called it a day. 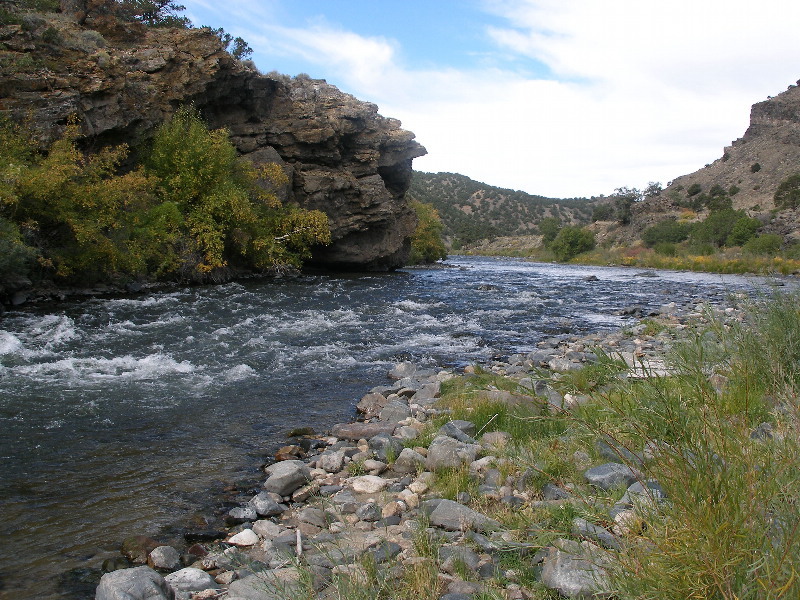 I decided to fish the South Platte River in Waterton Canyon to avoid gasoline consumption. Jane, Amy, Max and Kirk agreed to bike the canyon, but I left before them. I reached the spot I planned to fish in the special regulation area above the diversion dam by noon. I ate my lunch, and then I put on my waders and began fishing upstream. When I checked the stream flows, the chart displayed around 67 cfs. I knotted a yellow Letort hopper and beadhead prince nymph to my line. I chose the prince because the water was just a bit off color, and I guessed that it would be more visible. The visibility strategy worked rather well, and I landed 16 trout on the day. I caught rainbows and browns in a 50-50 mix, and half the trout slurped the Letort hopper, and the other half preferred the prince nymph. In one long smooth pool I spotted a solitary rise, so I cast the hopper a couple times, but the riser showed no interest. I decided to try a fur ant, and I selected one with a small white poly wing post for visibility. I cast above where I spotted the rise, and a rainbow rose and sipped the ant. 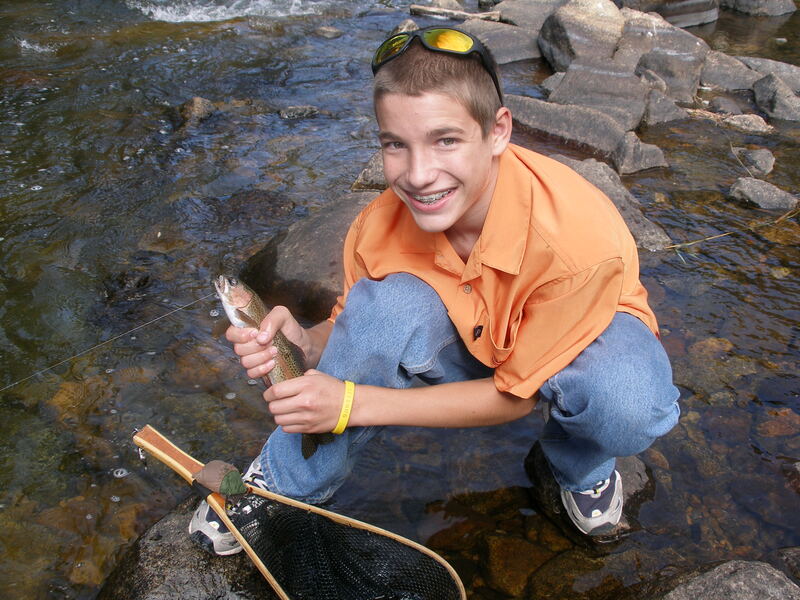 I went back to the hopper and prince after this incident and continued catching trout. I stopped fishing when I reached the first bridge that crossed over the river.